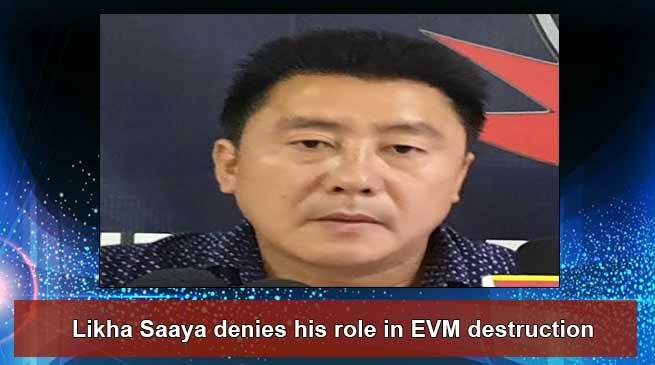 Former MLA of Yachuli, Likha Saaya today denied his role in EVM destruction case of Panyia polling station of 16 Yachuli Assembly Constituency on April 11. “I have sacrifices to contest when the BJP party denied me party ticket to contest from Yachuli assembly constituency of Lower Subansiri district wherein Taba Tedir was given with the party ticket and was made the official candidate. I was in the party and is still in party and will remain in party”, said Saaya. Saaya while addressing the media at Arunachal Press club today said that “I was appointed as star campaigner for the part and was touring in Eastern Arunachal Pradesh and some other parts and sincerely campaigning for the party” . “On the poll day on April 11 though I went to the Panyia polling station which is located at my village to see and request the presiding officer for helping physically challenged, and old aged voters who could need support to go to polling booth”. I left away the polling station after meeting the PO and later the news of EVM breaking come. Who have damage the box will get punishment as per law, Saaya said. He said that the Yachuli being a peaceful constituency and wanted that there should be no such incident but it would be an act of someone to damage his hard earn image and reputation in the eye of public. It is to mention that a video was in circulation in social media where the presiding officer of 8 Panyia polling station of Yachuli assembly constituency allege that LIkha Saaya have argument with him in the polling station and later he left away. After his passing away few miscreants come and damaged the EVM with hammer.